In additon to the differences already listed in this blog, here's a summary of some other minor differences we've found. When you click on the Number category shown here for a second or subsequent time in a BIDS session, the dialog box tends to disappear. This bug doesn't seem to be present in Report Builder 3.0. You can click on the dropdown shown to choose a different report item in BIDS. In Report Builder 3.0 you can still see what you have selected - you just can't change it. 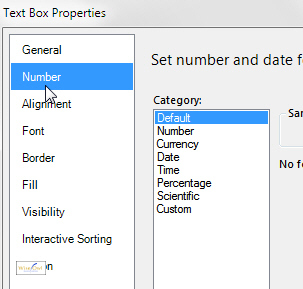 In Report Builder 3.0 this drop down list is populated with a list of the parameters in the subreport - shame this doesn't happen in BIDS. Should you be using BIDS or Report Builder? What this blog shows is that it doesn't matter too much. 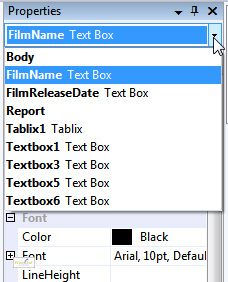 We'd go for BIDS and Visual Studio, as the lack of intellisense in the Report Builder expression builder is annoying.